The Southern California Golden Bears Highpower Rifle Club was formed as a sporting club in 1986. The 17 founders were interested in shooting their newly acquired M1 Garand rifles. Those rifles came from the predecessor of today’s Civilian’s Marksmanship Program (CMP) which was then called the Department of Civilian Marksmanship (DCM). For over nearly 30 years the Club has met once a month and held a National Match Course competition the third Sunday of the month at Angeles Ranges. The goal of the club has always been to advance the competitive highpower rifle shooting skills of its members and to provide a venue for new shooters to be introduced to the sport. While the Angeles Ranges Complex offers only a 100 yard reduced course for competition, this has been ideal for beginners as well as experienced shooters seeking to refine their skills. In addition to holding high power rifle matches, the Club offers instructional sessions and supports organized shooting at the local, state, and national level. The Club has over 90% NRA membership and is a member of the CRPA, NRA, and CMP. Hundreds of shooters have taken advantage of the matches and Club meetings to learn the course of fire for Service and Match Rifle and Regional Highpower matches and a number of the Club members have gone on to win National Level awards. The equipment used has evolved from carbines, M1’s, and M1-A, (.30 caliber rifles) to California compliant AR-15 rifles in 5.56 caliber. The club has loaner equipment to assist new shooters in getting started. As a shooter’s interest increases, one will start to collect the equipment (coat, gloves, stools, scopes, stands, etc) that allows for convenience and improvement in scores. The club started hosting NRA and CMP matches and instructional sessions in the 1990’s and continues this tradition today. This has allowed new shooters to obtain NRA ratings and improve their marksmanship. While providing a cadre of shooters to develop and win numerous State and National awards. 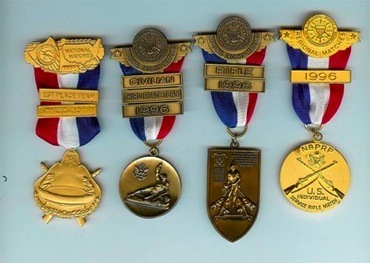 Golden Bears have been on California’s Service Rifle Teams at the Camp Perry National Matches with many earing their “Distinguished Rifleman” badge and a few earning President’s 100 tabs. Golden Bears have won four Women’s Class 600 yard National Trophies. Members have become NRA and CMP Firearm Instructors. The club continues to thrive and has made its home on the Fort Angeles private range in the Angeles Ranges complex. Come out and shoot with Southern California’s Golden Bears. Check out our Events page to learn more and hope to see you on the line.